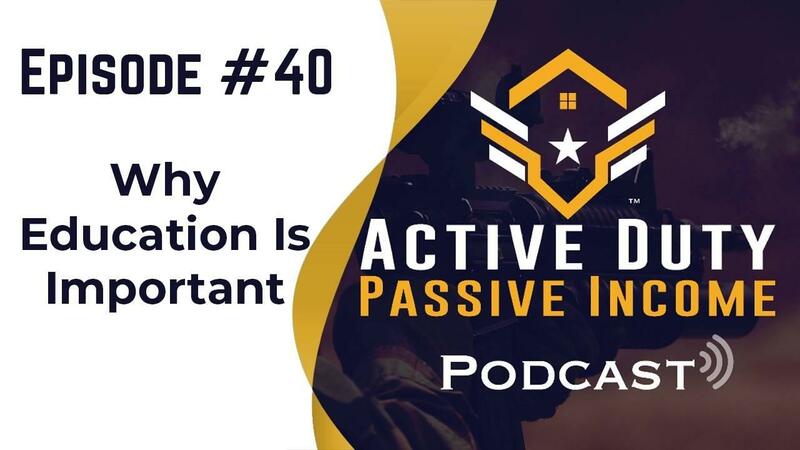 Hey hey what's going on guys welcome to the active duty passive income podcast. All right today's episode is on education and why it's so important for you guys to know what’s going on and how that's going to affect you as we move forward. Are we on the verge of another recession? Do I think so? Yes all right is my personal opinion that we are and it's definitely important for you to understand the factors that go into that and why? You know this is going to, I'm sorry rather how this is going to affect you as a service member or as a veteran right or you know you as a family unit right. I mean you guys need to understand you know what to do in order to prepare and also how to take advantage of it when the market drops and how not to let the dropping market take advantage of you okay. Because that is the biggest thing. Now well I'm going to go into it, right I'm going to go into it. Now so when the market drops what do we see? We see lower prices, we see you know higher costs right for borrowing right and which I'm going to talk about the Fed rate here in a minute. We’re going to see a scarcity in demand right for housing in general. So things are going to drop right and that can be really good for savvy real estate investors. Because you can pick up deals in areas that you couldn't find before okay. Now when I say that let's talk about where the biggest drops happened back in 2007-2008. You saw the markets in California right take some of the biggest hits in Las Vegas right and Nevada right. That was some of the biggest hits New York. New York lost a lot of money in the recession. Heck you know even saw prices drop into Florida you know what I mean and in Texas too. Texas saw a lot of big drops in some of the metropolitan areas. I don't know if you noticing a trend here, but you know the biggest hits happened in you know class a big metropolitan areas. Now one of the things that I love to talk about all the time is that investing outside your backyard is super important and when you're looking at Midwestern markets right. Markets that are historically a lot lower right in price point and a lot more stable, those are the areas that see less of the effect of the drop. Why is that? Well because the jobs in the area right, the job market doesn't necessarily keep up with the increase of housing. So right now let's say for instance right how much does it cost you to buy a home in a very very gentrified expensive you know area? The only people typically who are going to afford that are white-collar individuals. but what happens when you know white-collar jobs start to get lost due to you know again higher costs for employment, higher costs for spending, higher cost for borrowing right. Businesses start to flex and businesses don't start to spend less, I'm sorry to start to spend less. Which means that there's going to be some budget cuts somewhere right and that's going to happen in people's employment. That’s going to happen in in a lot of different places. But when you lose your job as a white-collar individual, alright what's going to happen to your housing situation? Well you may not be able to afford your awesome expensive mortgage anymore, so you're going to have to find something a little more affordable. What does that mean? That means you're probably going to rent. Which means we're going to see more folks starting to rent okay when the market starts to tank. So that can be really good for savvy investors. But that could be really bad for you as an active duty service member or a you know even a veteran right. I mean if you're trying to buy a home with your VA loan and you're spending zero money on that property, someone can try and swindle you right and you may find a realtor that tries to sell you a place at a really high price and will your mortgage be able to keep up with this high price you know when the rates start to drop and you lose a lot of money in equity and you're upside down in your mortgage. You know let's say you have to leave the area, let's say you leave on orders and then you realize that the rent in the areas have dropped a little bit because of XY and Z and you can't keep up with the rental market. Because your mortgage is too high. So now you're losing money. You see what I'm saying here. I mean these things can get really really you know crazy for folks who are not educated. So it's very important for you to understand what's going on. That way you can fight against it okay. Now let's talk about the rising Fed rate for a second and what does this mean. What is a Fed rate first of all? well the Federal Reserve Board okay which is the governing body of the Federal Reserve System sits right on this board and they watch certain factors. Typically when inflation is more than three percent in a year right then they'll start to raise the rates. Now because of the market and how good we've been trending for a while now alright, the Federal Reserve Board is starting to raise the rate. they mentioned back earlier this year that they were going to raise it quite a few times and to date they've raised it three times since the start of 2018. They’re also anticipating to raise it again here before the end of the year. So it's definitely important to watch that as you know as the federal rate increases, we will start to see other you know ancillary effects in the market okay. Now the federal funding rate is the rate at which banks lend each other money okay. So as that Federer starts to rise, we're going to see you know higher interest rates and higher borrowing costs in general okay. Not just with mortgages but you know with credit card, yeah credit card interest rates are going to increase and other loans right are going to increase. Essentially you're going to start to see higher borrowing cost across the market in general. okay so if we are going to spend more to borrow money, all right then you're going to see a lot more people not borrowing as much or at all really because they can't afford it and again like I said you know when the economy goes up right, that doesn't necessarily mean that you're going to start to get paid more on your job. Typically you don't see that. You see a rise in pricing, but you don't see the same rise you know come from folks that are employed right, promotions. You know people still don't get promoted that much you know what I mean. So you're not going to see an increase of income for individuals. Which means that you know stuff is going to get more and more expensive. People are going to start saving more, they're going to start cutting back on their costs. So the demand for goods and services are going to drop okay and then you know what does that necessarily mean? So for you as a real estate investor right you're not going to go out and borrow more money just so you can, let's say spend on a flip right. Your costs are going to be so much and maybe it doesn't make sense. Especially with the rising Fed rate that means that your holding costs are going to increase as well for every month that you have this property either getting fixed or on the market trying to sell, you're going to be paying more and more money. Because the interest rate that you're spending from borrowing that money from the bank is going to be more as well. So what does that mean? That means you're going to start to see a lot more cash buyers okay and a lot less flippers in the market. Because flippers are going to lose big, especially if they're uneducated. so for you, if you're going to start getting into the flipping game; you want to understand what it is you're doing, how long your property is going to sit on the market and I mean really you just got to have to watch every single dollar you know I mean let's be honest here. Because if you are getting in this market you know new, it's going to be a lot more expensive for you now than it was back in 2009 right, 2010 where the markets you know hit their bottom pretty much. Okay so understand that and you got to make smart decisions. Mortgages are going to be more expensive okay. So you're going to see more people starting to look to rent. I mentioned that before too right. If people can't afford the mortgages. Because again right their income hasn't increased to you know to the market and then its people are going to start to look to rent alright. I mean people already look to rent you know. I think there's a misconception when it comes to mortgages and people just assume that renting is easier. I mean maybe it is in some cases sure. But you know what that can make a savvy real estate investor very very wealthy okay. So our goal here with ADPI is to inform you on how to become a savvy real estate investor, so you can benefit okay. Because what is said to us to see is just so many service members getting taken advantage of you know with their VA loan. People don't understand the VA loan and so you know a seller will think that hey you know someone's going to buy from me, they have a VA loan; that's great. They can get covered up to let's say $400,000 in an area. So I'm going to sell my house for three hundred and fifty dollars, three hundred and fifty thousand dollars right. Because they want to get as much as they can. But maybe that house is only worth like two hundred and fifty thousand dollars right. But you know this uneducated person you're just looking to buy their first home, doesn't know that. So boom right there you go and there's a service member getting taken advantage of and that happens so much more than you can think. That’s why it's important for you to not only work with a good realtor right, someone is going to help you out if that's what you're doing. But you have to have an understanding for the market itself. Right you have to understand how to evaluate comps in the area. How to understand what you're paying before you pay it right. All these factors go in to education and it's so important, it is so so so important so that you don't get taken advantage of before this market tanks okay. now the way things are trending right, it looks looking like it's going to happen here semi soon okay and semi soon I mean within like you know the next two years or so okay. So I mean who knows right, who knows. I'm not a market analyst by any stretch of the imagination. I've just been doing a lot of listening, I've been doing a lot of reading and you know I've just been trying to correlate some of these trends that I've been seeing. purchasing of housing has dropped you know significantly in the last quarter according to an article that I read last year you know and that's just because again like the costs are just too high now right. In some markets it's incredible. You know you'd be surprised how much it costs to buy I know New York, but in New York City just he started took a big dip. I think they've dipped like what in the double digits now for the past two quarters I believe was from the article that I read last week as well. you know I'm just listening to a lot of, I'm looking at a lot of these things that's going on and I'm starting to see you know good indicators that we're going to start to see a drop here pretty soon. You know it's important for you to understand that you know as you are either transitioning from the military, maybe you've already transitioned or you're just joining or you've been in for a little bit and you've got a little bit to go, understand that the factors of, I'm sorry understand that education right education is super important in moving forward ok.
You don't want to get taken advantage of and you want to understand what's going on. So that way you can be on top. So finding off-market deals is great. Go out there, go ask around in your neighborhood. Find out if there are folks that maybe are looking to sell their property. Cause if you find that off-market deal there's a great chance that you'll get it for a lot cheaper than you would just from you know looking on the open market ok. Zillow can be a really good tool if you use it right. Ok make sure you go and you check out the properties that were sold within the last 12 months all right, find out what they sold for. That’s how you determine some of the comps in the area ok. You want to always compare that little estimate that they tell you about how much your house is worth is crap. Ok don't look at that all right. I will never tell someone to look at that and say that hey this is something you should go off of. Make sure you talk to a realtor in the area if you don't have access to the MLS and you find out what the comps are you know within a mile from the place that you're looking or okay. It’s important because you need to have accurate numbers as you're moving forward and then understand what people are spending in your area before you spend it okay. If you are going to you know do renovations for your home. Let’s say you just bought a home and you can do renovations. All right understand what you're doing with those renovations, how much you're spending okay. Because if you start spending too much, then you're going to end up putting yourself a horrible hole and that may not necessarily be good either. For those that are borrowing against their mortgage I understand that rates are higher now. Which means that if you refinance and you had a lower interest rate, then you will likely be paying more in your mortgage than you would you know than you were. I'm sorry all right. so if you're going to cash out refinance, let's say you're going to pull money from your mortgage, I'm sorry pull money from the equity right that you have in your mortgage and you're going to use that money to let's say renovate your garage or renovate your kitchen or something right. Because you want to do something HGT related, you are going to pay more every single month and you have to understand how that's going to affect your budget okay. So make sure that you take a look at that. if you're going to do that though, all right let's say you're going to take money out of your equity that you have in your mortgage and you're going to use that to invest in a property, that is definitely good as long as you understand the rate of return that you're going to get for that area okay. So it's smart to borrow money to buy an asset right. But it's not smart to borrow money to buy into a liability all right. So an asset is something that produces money for you. But a liability is something that just takes money away and doesn't put it back into your account okay and there are many liabilities out there guys. There are many liabilities that look like assets or people think are assets right. Like your home, your home can be a liability. If you are not using your house to produce income for you, then yes your house is by definition a liability. But it can be an asset to if you have certain you know ways to draw and come from it. That’s why we teach house hacking. 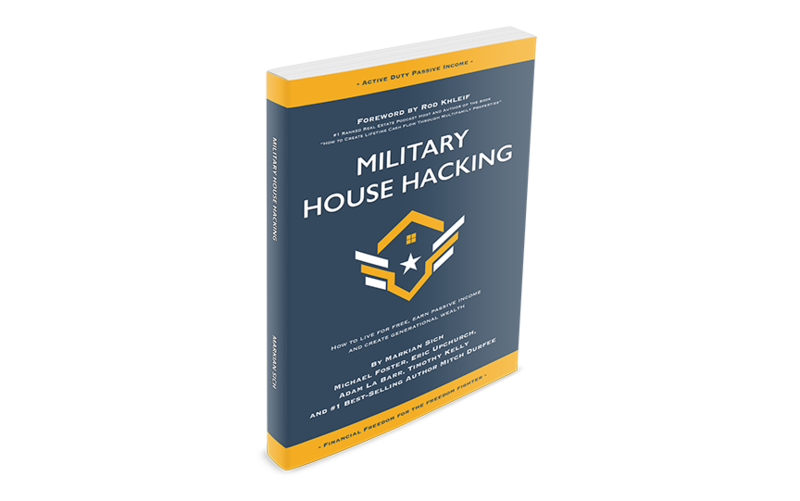 That’s why we just launched a book on military house hacking. Because there are many ways that you don't even have to be there and you can draw and come from your property right. So please please go check out that book if you haven't. If you haven't grabbed it yet, it's on Amazon. It’s really cheap. You can go get it and yeah it'll open up your mind really to just how you know you can turn your biggest liability into your biggest asset essentially all right. So yeah guys I mean again education is super important and moving forward with you know the way the markets trending right, I mean it's definitely scary you know how many veterans can get taken advantage of. I was just talking to an ADP ME member from South Carolina and she was telling me about our soldier that got taken advantage of with the housing market just recently. Just recently purchased house way above market value right. Simply because the realtor that she used kind of swindled her into purchasing a home from someone, who was taking an advantage of someone with their VA loan and that's and it happens more often than you can think okay. So for us to be educated, it's important especially when this market starts to turn. Because people will start to look to sell their homes for as much as they can right. Because they're scared that the market is going to drop and they're going to lose lot of money. Guess who they're going to look for? Oh you have a VA loan, you're good, you don't have to spend any money on it and you could just hold your house until however long and you're going to make money, so you're okay. No! Okay don't do that and don't fall in that trap. Buy smart and buy right. Make sure that your Realtor is working with you. Make sure that you understand what the comps are in the area right. Make sure that you understand what's happening in that area. Ask them for comps from the for the past year, two years right. Get some trends and do the market analysis yourself. If you're noticing that the comps in that area are rising, maybe that's a good thing. Maybe it's not right. you know if you're noticing that the comps in that area are falling right, maybe that's a good thing, maybe it's not you know. I mean you have to do your own education first before you can start going into just and just taking action, because you don't want to make that mistake. But at the same token you don't want to get trapped into analysis paralysis. So you have to understand okay how much education is necessary for me to know to go in and make my decision okay. And you also have to have an exit strategy all right. I definitely can't stress that enough. An exit strategy is important because what happens if that market does tank right. Ask yourself the hard question. If the market tanks tomorrow how am I going to get out of that situation where I'm upside down on my mortgage. Is the mortgage that I have each month you know still cheap enough underneath the cost of rent in my area? So if I wanted to rent my place out to someone, can they afford it? If your intention in buying a house is just because you want to get the biggest and baldest house on the block. you know you don't care how much you spend you just want to have a really really comfortable HGTV style of living and you don't do anything with it, well guess what either you're just going to get you know taken advantage of with this market buying in your little A class neighborhood and when the market tanks, you're going to be the one to lose a lot of money. Oh and by the way if your mortgage is above two thousand and you don't have you know a market for rent that high in your area, then guess what happens when you get orders and you get sent off to another location? You know let's hope you're able to find a renter. I pray you're able to find the renter. But you know if you're not you're going to lose a lot of money you know and losing a lot of money again is relative. Because your property is real okay. So understand that too that when you purchase real estate you're buying a real asset. So let's say that you can't find a renter for that much. Let’s say you find a renter for eighteen hundred and you're losing about two hundred dollars. Because your mortgages is you know 2000 okay. Yes that is bad. Because you don't want to have a rental property that gives you negative cash flow. Okay you never want that kind of situation. But if you look at it from perspective right. If you look at it from using perspective, you'll see that you know the asset that you have is real. So it's almost like you're putting that money right $200 into a bank account that is going to rise in value over time. If your intention is to keep your rental property for the rest of your life or for 30 years or whatever the case may be, the markets not going to be down forever right. At some point it's going to go back up and at some point your house is going to be worth more than it was. I mean we've had people on the podcast that have been through that. Buddy Rushing, perfect example of it. he spoke about you know how he bought right at the height of the market like the very very top of the market and how a few months later the market just tanked and he started losing so much money on the property and he's upside down. He still has that property today and just now today the property is getting right to about what he purchased it from back in 2008 all right. So I mean hey you know again real estate is not a get-rich-quick scheme okay. So you'll have to hold your properties for a while and by holding them you'll realize that they'll increase in value you know at some point down the road. But understand that if you are in the position where you're going to take a hit from your mortgage and the rent, let's hope that you're making enough to cover that expense. Because now that becomes an expense, right a liability and if your intention is not to hold it for the long term; let's hope you don't lose money on that deal okay. So important to understand guys all this stuff you know really matters and you can't just sell a property for like fifty thousand less and less your mortgages. Because I mean you can, but you're still going to have to owe that bank fifty thousand dollars right. So you have to pay that at some point all right. So important things to understand as you move forward in this market okay. Get educated, it is absolutely critical. You have to understand you know a few different scenarios just so you feel comfortable and moving forward. Because things changing guys and it's very important. That’s not to scare you. But it's to motivate you. Use our platform, leverage our platform, we've got so much stuff here for you that you can use to take advantage of and get ahead. But if you don't get ahead and you'll fall behind. But no man left behind right, no man left behind. Awesome. Think I'll end it with that. So that's going to wrap it up guys. Thanks so much for listening. If you are ready to get started changing your life in real estate investing, make sure you hit up our website; www.activedutypassiveincome.com and take our course and get plugged into our start the spark program. We offer mentorship for you guys. So we can all capitalize in what’s going on. Hey also make sure you check it out on the Facebook group. We’re going to have our live Q&A; a monthly question answering session on the Facebook group November 7 at 17:30 Pacific Standard Time all right. You don't know how to check that out make sure you become a member of our Facebook group, you can see that link in the show notes on below. Thanks so much for listening and we hope you guys have an awesome week, later.